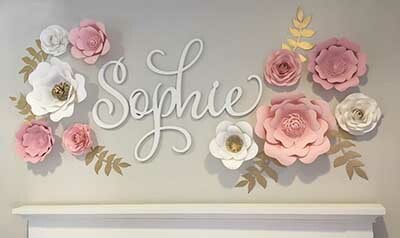 I love the giant 3D wall flowers for a baby girl nursery! They add a sense of depth and elegance to the room that, as easy as they are to apply, floral decals are incapable of. There are still situations where peel and stick win out but right now I am having a romantic moment with a different type of floral nursery wall. Now, I ask you, could that floral display be any more awesome? The font of the wall letters spelling out Sophie's name is one I'm not familiar with but that is neither here nor there. What makes her name stand out (in my opinion) are the paper flowers so artfully arranged around the wooden letters. The flowers that are on this baby girl's nursery wall are made of paper which are amazingly easy enough to DIY if you have the time. This tutorial takes every little bit of the mystery out of the process and if you follow the step-by-step instructions there is a virtual guarantee that your DIY 3D wall flowers will be impressive; they will really take your decorating project to the next level. The crafty lady conducting the demonstration is making her flowers out of purple paper. However, matching the paper to the nursery decor will be easy so long as the weight and texture of the paper is correct. Please share pictures of the giant 3D wall flowers that you made for your baby girl nursery using the tutorial. Upload photos of your craft project using the submission form on Unique Baby Gear Ideas' "Get Featured" page. Join in and write your own page! It's easy to do. How? Simply click here to return to Nursery Wall Flowers.